Jan. 16-Mar. 21, 1865 Sherman’s march north. Moving into South Carolina, Gen. Sherman’s army continued laying waste to everything in its path and setting more than a dozen towns on fire. 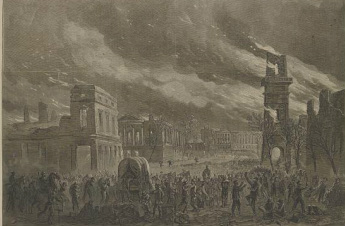 Columbia, capital of South Carolina, was among those heavily damaged by fire (Feb. 17), although Sherman blamed retreating Confederates for that fire (never proved). 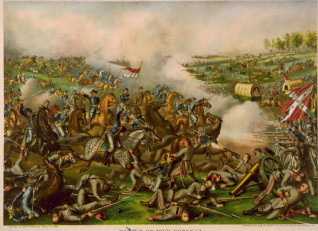 Soon after, Gen. Sherman defeated an attack by a smaller Confederate army of some 24,000 led by Gen. Johnston at the Battle of Bentonville, N.C. (Mar. 19-20). Sherman then marched north to Goldsboro, N.C. (Mar. 21). Feb. 1, 1865 Thirteenth Amendment, abolishing slavery in the US, passed by Congress; ratified (Dec.). This was the first of three amendments passed as a result of the Civil War. Feb. 3, 1865 Hampton Roads Peace Conference held aboard the steamer River Queen near Hampton Roads, Virginia. Confederate Pres. Davis insisted on recognition of the South’s independence, however, and the conference ended as an unsuccessful attempt to negotiate an end to the war. Feb. 6, 1865 Gen. Lee made overall Confederate commander (Feb. 6) as the Confederacy bordered on collapse. Apr. 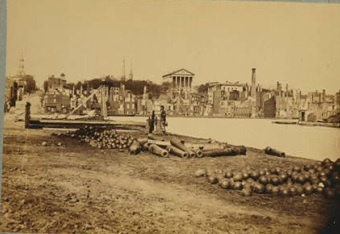 3, 1865 Fall of Richmond, the Confederate capital. After nine grueling months of siege warfare on the approaches to Petersburg, Gen. Sheridan’s rout of Confederate forces at the Battle of Five Forks (Apr. 1) crippled the already much weakened Confederate defensive lines. 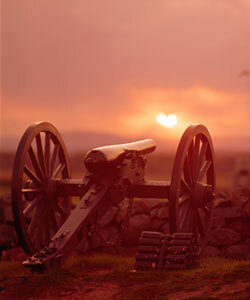 Gen. Grant’s general attack the following day finally broke through and rapidly took control of Petersburg. Gen. Lee and the Confederate government thereupon hurriedly evacuated Richmond (Apr. 2). Gen. Lee headed for Lynchburg, Va., and its rail line, which he planned to use to link up with Gen. Johnston’s 30,000-man army in North Carolina. 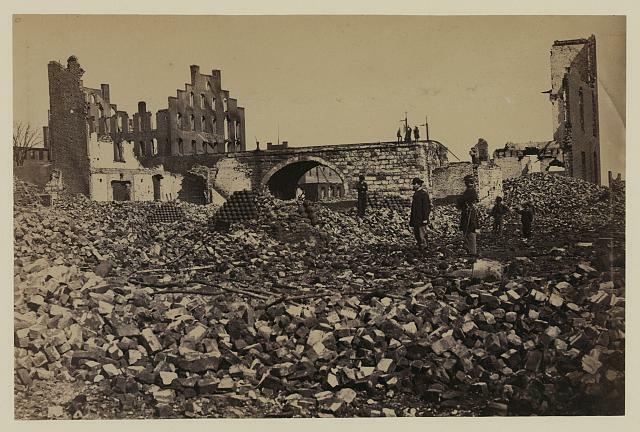 Seeking to deny war supplies to the advancing Union army, the Confederates in Richmond set fire to military stores, including amunition stockpiles, causing a conflagration that spread rapidly and destroyed much of the city. Close up of destruction in Richmond. Apr. 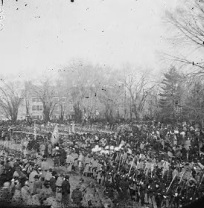 9, 1865 Surrender at Appomattox Courthouse, Virginia. Gen. Lee’s escape westward from Richmond with less than 25,000 of his troops was short lived. With Grant’s pursuing troops threatening Lee’s flanks and rear, Gen. Sheridan maneuvered into a position near Appomattox Courthouse to effective blocked further escape to the west (Apr. 7). Virtually surrounded, cut off from supplies, and running out of food for his troops, Lee had no choice but surrender. On Apr. 9 at Appomattox Courthouse, Gen. Grant took Lee’s surrender with fairly lenient terms, effectively ending the war. Lee’s troops were required to surrender their weapons, but were allowed to keep their own horses and return to their homes. 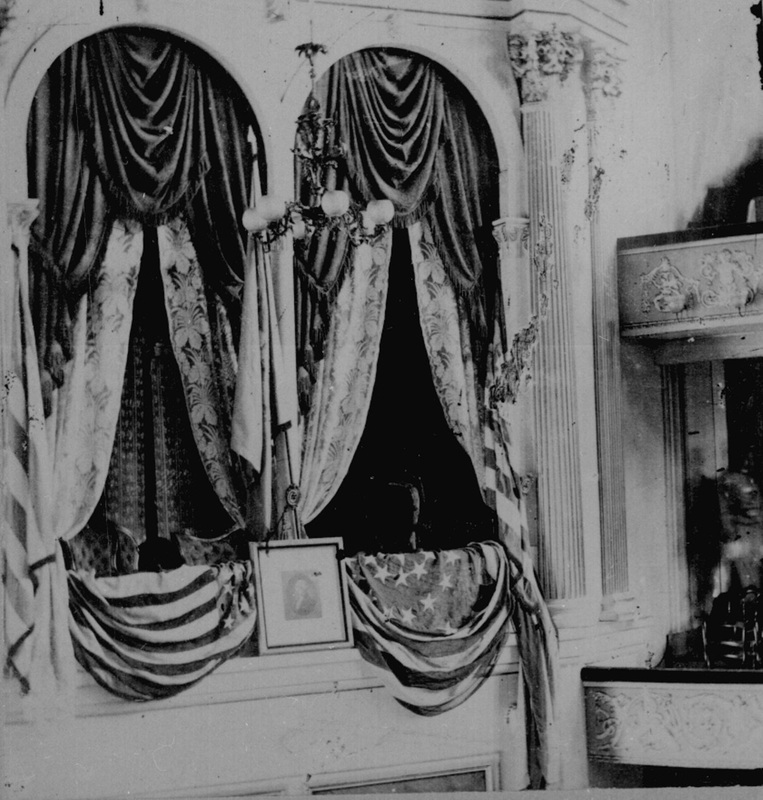 Lincoln's box at the theater, after the assassination. Apr. 14, 1865 Lincoln assassinated at Ford’s Theater in Washington, D.C., by actor John Wilkes Booth. Booth, a staunch supporter of slavery and the South, had nurtured a deep hatred of Abraham Lincoln. After serving as a volunteer in the militia that hanged abolitionist John Brown (1859), Booth became a Confederate secret service agent during the Civil War and conspired with others to kill Union officers. By 1864, Booth had organized a group of conspirators in Washington, D.C., to kidnap President Lincoln, but his attempts failed. When the war ended, Booth decided to assassinate Lincoln instead and on April 14, just days after the South’s surrender, Booth discovered that Lincoln would attend a performance at Ford’s Theatre that evening. Entering Lincoln’s box during the third act, he shot the President through the back of the head and made a desperate leap to the stage below, breaking his leg in the process. Still, he managed to escape into an adjacent alleyway. Booth’s co-conspirator Lewis Powell failed in his attempt to assassinate Secretary of State William Seward, but Lincoln died the following day. The escaping Booth was treated by Dr. Samuel Alexander Mudd (later imprisoned for helping Booth) and managed to elude authorities until Apr. 26. Federal troops surrounded a tobacco barn in Virginia where he was believed to be hiding and after firing into the structure, set it ablaze. 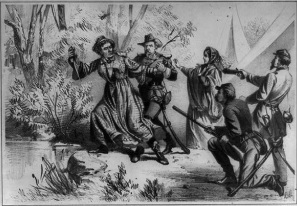 Booth was either shot or shot himself and his body was later identified by his acquaintances, though rumors did spread that the body was not Booth’s. Eight of the nine other suspected conspirators were convicted (four hanged and four sentenced to prison terms). Apr. 18, 1865 Gen. Johnston surrenders With Gen. Sherman’s Union army now occupying Raleigh, N.C., Gen. Johnston decided to ignore Confederate Pres. Davis’s calls to fight on and surrendered his 37,000-man army. Sherman granted lenient terms of surrender similar to those at Appomattox (Apr. 26). Confederate Gen. Kirby Smith’s surrender at New Orleans (May 26) marked the end of organized Confederate resistance. May 10, 1865 Confederate Pres. Davis captured (May 10) Having fled Richmond with the rest of the Confederate government, Pres. Davis was captured at Irwinville, Ga. He was imprisoned at Fort Monroe for two years and was released May 1867. Vice Pres. Stephens was also captured and imprisoned at Fort Warren in Boston for several months before being released.